There comes a situation where we feel we want to check all the accounts of Facebook on our computers. This applies in particular to all concerned parents who want to control their children. 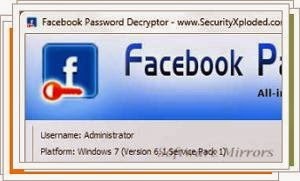 This may just explain why Facebook Password Decryptor is very useful. Facebook Password Decryptor, as what its name clearly suggests, is a tool that allows decoding to recover the Facebook password used with any web browser or messenger. Supported browsers are Internet Explorer, Firefox, Google Chrome, Opera Browser, Apple Safari and Flock browsers. It also supports Paltalk Messenger and Miranda Messenger. The great thing about Facebook Password Decryptor is that it allows you to save all the login details in plain text, HTML and XML files so you no longer have to do the job. You can also order a login username and password for easy navigation for users who are not experts on the PC.